NEW YORK -- Phish announced its 13-show run in New York with a video in January that showed giant doughnuts rolling through the city. That got Felicia D'Ambrosio's phone buzzing, with calls from friends hoping that might mean a role for the Phish superfan and co-owner of a Philadelphia doughnut and fried chicken shop that had made doughnuts dedicated to the band in the past. "Well, no, I don't want to work on Phish tour," thought D'Ambrosio, who has been to more than 100 shows. Then came the request. From the band. Doughnuts are everywhere in Phish's "Baker's Dozen" residency at Madison Square Garden, which kicked off last week and lasts until Aug. 6, from the tickets to a huge mural to the thousands of Federal Donuts being given out to fans each night. The band is even working each night's custom flavor into its setlists. The band "never stops surprising me and delighting me and I trust them," D'Ambrosio said. "To us at Federal Donuts, it's this weird collaboration of this thing you love and this thing you love." 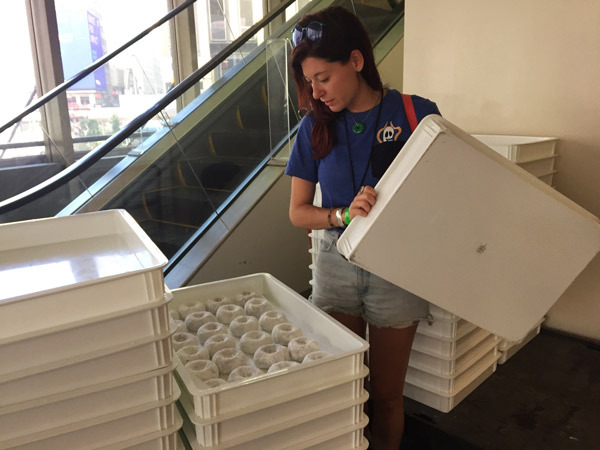 In this July 26, 2017 photo, Federal Donuts partner Felicia D'Ambrosio inspects boxes of doughnuts to be handed out to fans of the band Phish in New York. Phish's doesn't need gimmicks to draw fans to their mostly sold-out shows, but they are known for playful gags on stage. One song features guitarist Trey Anastasio and bass player Mike Gordon performing while jumping on trampolines, and drummer Jon Fishman's other instruments include a vacuum cleaner. It was Fishman's standard outfit - a blue dress covered with red doughnut shapes - that first inspired D'Ambrosio to whip up The Fishman - a blue vanilla raspberry doughnut with a pink glaze - ahead of a 2015 show. Mark Welker, the executive pastry chef at New York's Eleven Madison Park and NoMad, took notice of the Fishman doughnut and another Federal Donuts creation, The Fluffhead, named for a classic Phish song - and when the band came to him for a recommendation on a doughnut maker for the residency, he recommended D'Ambrosio. "I knew their doughnuts are really, really good. They're fans. This is the only option," Welker said. The band sent its flavor ideas to Federal Donuts chef Matt Fein, who came up with his interpretations to send back to the band. "Then they were like, 'yea, rock and roll, go for it,'" D'Ambrosio said. "It was nice and simple." For the Phish strawberry doughnut, Fein said that his muse was a Good Humor Strawberry Shortcake Dessert Bar. He made the shortcake topping out of freeze-dried strawberry and doughnut crumbs. "It's neat to get their take on what they wanted and then be able to put my name on it," Fein said. "Most of the flavors they chose were pretty traditional. That being said, they said growing up they only really had traditional" doughnuts. 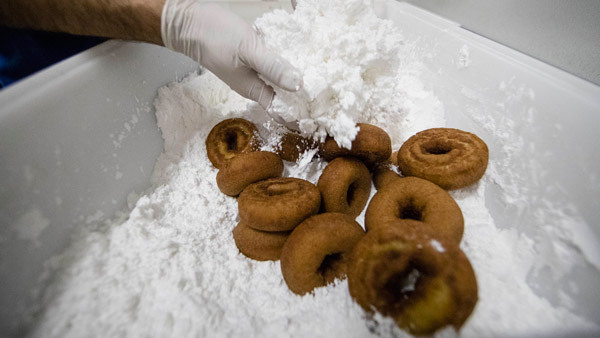 Federal Donuts employees are putting in overnight shifts to get the doughnuts made in Philadelphia and shipped up to New York for each show - but Fein said the fact that the band is working the flavor into the show makes the extra work totally worthwhile. Coconut on the first night brought a cover of Harry Nilsson's "Coconut" ("she put the lime in the coconut"), strawberry had the band performing the Beatles' "Strawberry Fields Forever" a capella, and night three's red velvet meant an opener from the Velvet Underground and the Phish classic "Wading in the Velvet Sea" to end the second set. Tuesday nights "jam-filled" honey-dipped doughnut saw the band extending songs that even it doesn't usually jam to. "Lawn Boy" usually lasts a few minutes, but went on for a half hour. It wound up trending on Twitter. Welker said that his favorite part has been watching D'Ambrosio's reaction when "Strawberry Fields Forever" began. "She did all of this," Welker said. "To think they're playing songs and she's making doughnuts has just got to be the best experience."